The Mt. Sinai Girls Basketball Team. Hauppauge, NY - At the General Legislature Meeting on Tuesday, March 28th, Suffolk County Legislators Sarah Anker and Kara Hahn honored the Mt. Sinai Girls Basketball Team for winning the Class “A” Suffolk County Championship for the first time in school history. The team, led by Coach Michael Pappalardo and Assistant Coaches John Mees and Tom Walker, won the title in February by defeating the Harborfield Girls Basketball Team with a score of 54-42. 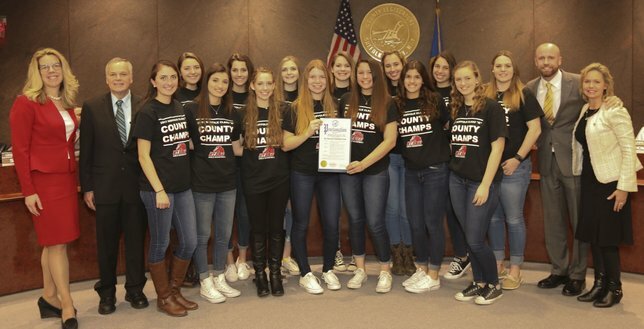 Along with the county championship title, the team won the Suffolk County Small Schools Championship and was a Section XI New York State Regional Finalist. The team’s league record was 13 wins and 1 loss, and the overall record was 23 wins and 3 losses. Members of the team include: Catharine Aretakis, Rebecca Bilello, Brooke Cergo, Elizabeth Deller, Nicole Gill, Cristina Gulli, Nicole Hurowitz, Victoria Johnson, Margaret Kopcienski, Holly McNair, Gabriella Sartori, Megan Shanian, Veronica Venezia, and Olivia Williams. For more information about Mt. Sinai sports, please visit: their website. Subject: LongIsland.com - Your Name sent you Article details of "Legislator Anker and Legislator Hahn Honor the Mt. Sinai Girls Basketball Team"